Hi, I'm Frederik L. Schodt. 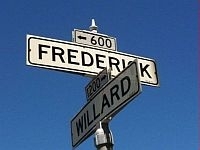 You'll note that my first name, "Frederik," doesn't have a "c" in it, which makes me somewhat unusual, it seems. I was named after King Frederik IX of Denmark, and while I never met him, I understand he was a fine fellow, so I don't mind being named after him. Oddly, I notice that on English Wikipedia they spell his name with a "c," so go figure. My last name, "Schodt," (pronounced "shot," as in "shotgun," here in America) is also Danish and complicated. For years, this was a bit of a problem for me, almost a curse, since no one could ever spell my name right. Now, however, I realize that difficult names are something of an advantage. In the age of mass-everything, uniqueness is good. And in the Internet age, when doing Google searches, odd spellings are particularly good! I'm easy to find. Oh, I nearly forgot. My middle name is "Lowell." I was named after L. Bruce Laingen, an old family friend. In 1979-81, he experienced considerable notoriety as the chargé d'affaires at the United States embassy in Tehran, when he was held hostage for fourteen months. Ironically, he doesn't use his real first name. I don't know why, but maybe it's because "Lowell" has lots of "l"s, which are hard for some people to pronounce. I'm a writer, translator, and conference interpreter. I also do some public speaking. I'm very diversified and specialized at the same time. That way, I never get rich, but I never get bored. Most of my interpreting is simultaneous and technology-oriented, Japanese-English, yet that part of my career is not the main focus of this website; the books and translations and associated trivia are. Almost everything that I do is in some fashion designed to facilitate communication between people in North America and Japan. A lot of people think that I only do work related to manga or anime, but actually my writings and translations are considerably broader in scope. I've written books on popular culture, history, and technology, and translated everything from government documents to literature. Since manga and anime have become quite popular outside of Japan, I recently have many young people ask me how they can become a professional manga or anime translator, "like me." My response may sound disappointing, but as popular as manga and anime are today, I know very few people who actually make a living translating manga and anime exclusively; most are forced to work in other areas as well. But that doesn't mean it shouldn't be done! I also have more and more people asking me how to become a published writer, and I honestly don't have very many good recommendations. It's not easy, and it involves a lot of luck. But that also doesn't mean it shouldn't be tried! TThe portraits/mug shots below were rendered by a Panasonic artificial vision system. 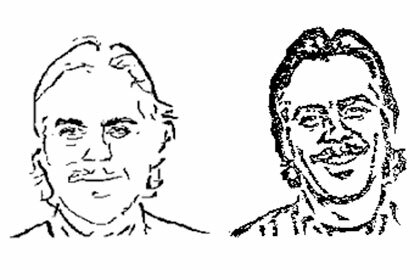 The one on the left was drawn by a robot, the robot arm holding an ink-soaked brush and tracing the outlines generated by the vision system. The one on the right was output as a rubber stamp, which I used to create an image on paper that was then scanned into a computer. Do the images really look like me? Do I even exist? You guess! The February 1999 issue of the British magazine, Manga Max, described the Revolver Ocelot action figure as a "Fred Schodt-look-alike." Revolver's a character from the popular Konami video game, Metal Gear Solid, and the action figures are made by McFarlane Toys. You can view Revolver from all sorts of angles with a variety of information by clicking here. I don't normally carry two pistols or wear a trenchcoat. I'm actually a relatively peaceful person. 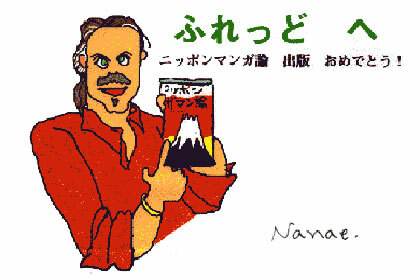 The drawing below is by Nanae Inoue, before a hair cut. 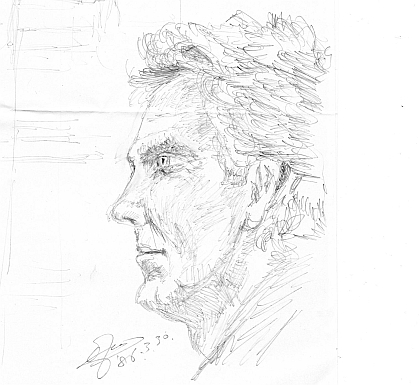 And here's a portrait of me, done years ago, by Yoshiyuki Tomino, of Gundam fame. He's a very good artist, and made me look better than real life. II live in the San Francisco Bay Area, and have for a very long time. Why do I live in the Bay Area? I grew up in the United States, Norway, Australia, and Japan, and chose to live here because, frankly, it's a very beautiful place and once you get used to the weather it's hard to leave. It's also a very cosmopolitan area, with many different people and languages and a slightly European/Asian flavor, which makes me feel comfortable. And it's within minutes of fabulous natural parks and wilderness areas and even the Pacific Ocean, all of which also make me feel comfortable. Why is this website named "JAI²"? You'll notice here, that it isn't jai, but jaya. I've been told that this is a Sanskrit word, perhaps meaning victory; or praise, or hail or something honorific. To me, though, neither jaya nor jei are as important as JAI, which has a significance all of its own (oh, yes, and by the way, before going any further I should mention that I'm not a Krishna devotee, or even, as Swami X might have said, a "Harvey Kirshman."). Long ago, when I lived with a dear group of friends, JAI became a word that represented all good things, so that's the association that I like to maintain. It was also the name of a very special black cat of mine.... In fact, JAI can be almost anything you can imagine! If you'd prefer, JAI could also be an acronym, I suppose. It could be the Japanese American Institute or the Javanese Armadillo Inquiry, or my personal favorite: Just Anything Interesting. So why JAI(²)? you might ask. In chants and music jaya or jei are usually used in pairs; jai jai it has a nice ring to it when repeated. Besides, two JAIs must be better than one, and if so, JAI (squared), or an exponential increase, must be even better yet. Of course, many people ask how they can enter the exponential "2" in a web site address, but I'll leave that up to your imagination. Isuppose it's customary to list awards and accolades on this kind of a page, so I've thought up nearly everything I have ever been awarded. If I can think up more, I'll add them as time goes by. Some childhood ski medals in Norway, in slalom and cross country. In Australia, a small award for poetry in seventh grade, I think it was. 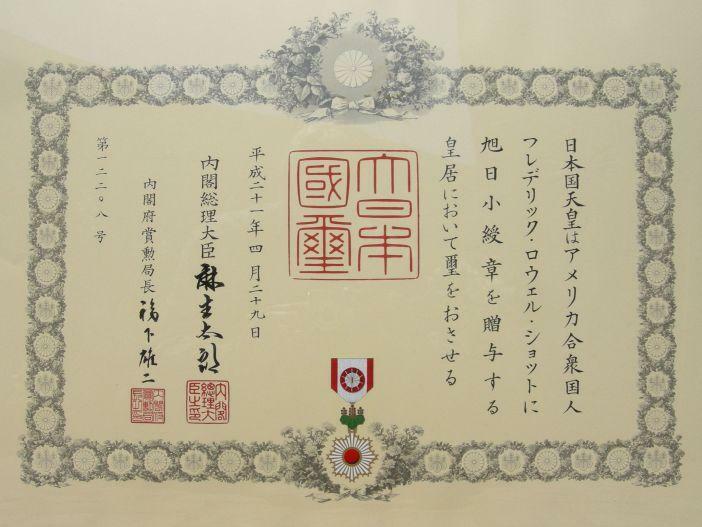 In 1975, a scholarship from the Japanese Ministry of Education to study translation and interpreting. 1983, Manga! Manga! received a modest publication assistance grant from the Japan Foundation. 1983, won the Japan Cartoonist's Association, Manga Oscar, Special Award, for Manga! Manga! 1988, Inside the Robot Kingdom was named one of the "best sci-tech" books of the year by Library Journal. 1993, given the "Osamu Tezuka Award" for "Outstanding Contributions to Manga and Anime" at the Anime America convention. 2000, translation of Henry Kiyama's Four Immigrants Manga was a finalist in the USA Pen/West translation award. 2000, my name was engraved in a granite memorial erected in Neu, Japan, to commemorate Henry Kiyama and the Four Immigrants Manga [『漫画四人書生』の著者である木山義喬の没後５０年の記念碑]. 2003, received a publication assistance grant from the Suntory Foundation for Native American in the Land of the Shogun. 2005, Native American in the Land of the Shogun was chosen by the American Library Association's Choice Magazine , as one of the "Outstanding Academic Titles" of the year. 2009, awarded the Japanese Government's Order of the Rising Sun, Gold Rays with Rosette, for helping to promote Japanese popular culture in North America [旭日小綬章]. 2009, won the Ministry of Foreign Affairs International Manga Award, Special Category, for helping to promote manga overseas. . [外務省の第３回国際漫画賞]. 2010, was made one of the Distinguished Alumni of the Year (DAY) by International Christian University [国際基督教大学のＤＡＹ賞]. 2011, won the award for "best biography," at the Telopea Park high school reunion in Canberra, Australia. 2012, Professor Risley and the Imperial Japanese Troupe was awarded publication assistance grants from the Suntory Foundation, and also from the Japan Foundation. 2013, Professor Risley and the Imperial Japanese Troupe won the Stuart Thayer Prize for superior work, at the Circus Historical Society's annual convention in Peru, Indiana. 2016, granted the Ranald MacDonald Award for Lifetime Achievement ("Oeuvre") by the "Friends of MacDonald: The Dutch Connection," especially for work on Native American in the Land of the Shogun: Ranald MacDonald and the Opening of Japan (Berkeley: Stone Bridge Press, 2003). [VIEW==> VIDEO]. My report on the award is HERE. 2017, won third place medal in the 5k Run/Walk Race Through History at Piedmont's Mountain View Cemetery. My first athletic medal since I was ten years old, but of course I should point out that it was for my age group, and there were only five people in that category still running! 2017, my translation of The Osamu Tezuka Story 『手塚治虫物語』, by Toshio Ban and Tezuka Productions, published by Stone Bridge Press, was nominated for an Eisner award in the category of "Best U.S. Edition of International Material—Asia. 2017, The Osamu Tezuka Story declared a 2016 Foreword INDIES Winner in the Graphic Novels & Comics category. 2017, chosen for the Japan Foundation Award for 2017. Video HERE. For general category entry points, click home, and the various categories in the headers and subheadings on this website. Don't forget to check out scheduled talks, etc. And for my bibliography, which has most everything I've ever written in my entire life, take a look HERE. For those who still want more information on me, I have been interviewed dozens--if not hundreds--of times over the years, and many of the interviews are easy to find on the web. Here's a very early one, in Don Philippi's Technical Japanese Translation newsletter, No. 7, September 1983.